The Billionaire’s Portfolio is the only investigative research service that uncovers the lucrative positions held by the world’s richest, most influential investors. It’s that simple. These investors are buying, at times, as much as 60% of the company’s total outstanding stock. They cannot afford to be wrong. When we find one of our best of breed billionaire investors acquiring a stock, we send you all the details so you can come along for the ride. We deliver our actionable research directly to your email inbox, so please keep an eye out. We typically uncover a few of these lucrative opportunities each month, but you should expect to hear from us at least once a week – either with a new target stock or analysis and updates on existing picks. This strategy has guided us to double the return of the S&P 500 in our first year. And it’s rooted in finding deep value stocks. Even better, our process tends to do much better than the S&P 500 when the index falls or chops around. Our process is pretty simple. We follow the most powerful and influential investors into stocks where they control their own destiny. When they win. We win. These investors specialize in the concept of asymmetric returns — i.e. they only want to spend their time in situations where risk is defined, and the potential profit is multiples of what they pay for a stock. And they happen to be right a lot. But don’t go out and blindly buy every stock a big-time investor buys. 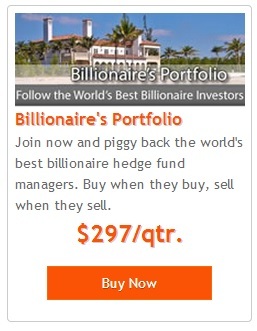 We hand-select only our top 20 stocks to invest in, and to include in our Billionaire’s Portfolio. In just the past year, subscribers to our service owned Office Depot, a beaten down retailer that no-one liked. We added it to the Billionaires Portfolio at $2.50, following the lead of billionaire investor Jeffrey Smith of Starboard Value. We exited at $5.27 with a double (read our entry note and exit note). We followed Highfields Capital into Genworth Financial at $5.20 (see our research note here). Our billionaire investor was pushing GNW management to sale its Wealth Management Group. That created value for shareholders. And that’s the name of the game. Our subscribers also had a near triple (NVAX) and near quadruple this year (SUNE). While many of these stocks take time to play out, while an activist investor is executing a game-plan to unlock value. Other situations can evolve quite rapidly. In 2013 we had a stock in the Billlionaire’s Portfolio that was acquired for a 90% premium in one day (STEC) — we held the stock for just over two months. And another that was acquired, resulting in a 70% gain, with less than a three week holding period (DGIT). If you haven’t joined our service yet, don’t delay. Bryan is the founder of Logic Fund Management, a macro-economic and global investment research, consulting and advisory business. At Logic, he has advised hundreds of thousands of investors from over 80 countries on global macro investing issues. Prior to founding Logic, Mr. Rich was a Senior Trader with Integra Investment Management, a nominee for Global Macro Hedge Fund of the year in 2005. He started his career with Traval, a family office macro hedge fund that managed assets for a wealthy European family. He has worked in London and on Wall Street. He also consults as an expert in global currency strategy, and has run equity and economic research groups for a leading independent research company. He holds an MBA from Rollins College. Use of this content, the BillionairesPortfolio.com website, and related sites and affiliates is provided under the BillionairesPortfolio.com Terms & Conditions of Use and Risk Warning.